Three summers ago, when I was feverishly researching my Scottish great-grandmother’s story for a novel I was writing based on her short yet dramatic life, I decided to go directly to the source: First, to the General Register Office on Princes Street in Edinburgh for solid documentation; then, with copies of those old birth, marriage, and census documents in hand, to the place my Scottish ancestors called home. So, one sunny morning on that fateful trip to Scotland, all alone and operating only on faith, I took a train from Edinburgh’s crowded Waverly Station north to Dundee, then a bus to Forfar, then another bus to my destination: Kirriemuir, a lovely little village of winding, narrow roads and shoulder-to-shoulder red sandstone weavers’ cottages, unchanged since my great-grandmother’s day in the mid-nineteenth century. As fate would have it, with only a few shy inquiries on my part and generous help from a few kind locals, I was soon put in touch with the perfect person to aid me in my quest – Sandra Affleck, the town’s foremost historian and author of three books on Kirriemuir and its most famous son, Sir James Matthew Barrie, author of Peter Pan. The connection Sandra and I made that afternoon in June 2011 has lasted, in fact deepened, to this day. But on that day, she dropped whatever she was doing to take me, a complete stranger and foreigner, on a long walking tour of the neighborhood where my great-grandmother, Helen Reid David, her husband-to-be, William Black, and their contemporary, schoolmate, and no doubt childhood friend James Barrie once lived. “This is where Helen and William were married,” Sandra said, pointing first to the copy of their 1881 marriage record in my hand and then to a broad, steeple-less building that once was the South Parish Church. “Unfortunately, we can’t go in. It’s been converted to flats…. As we walked the hamlet’s sidewalks side by side, I felt a strong kinship with Sandra, a grandmother, retired primary school teacher, writer, and J.M. 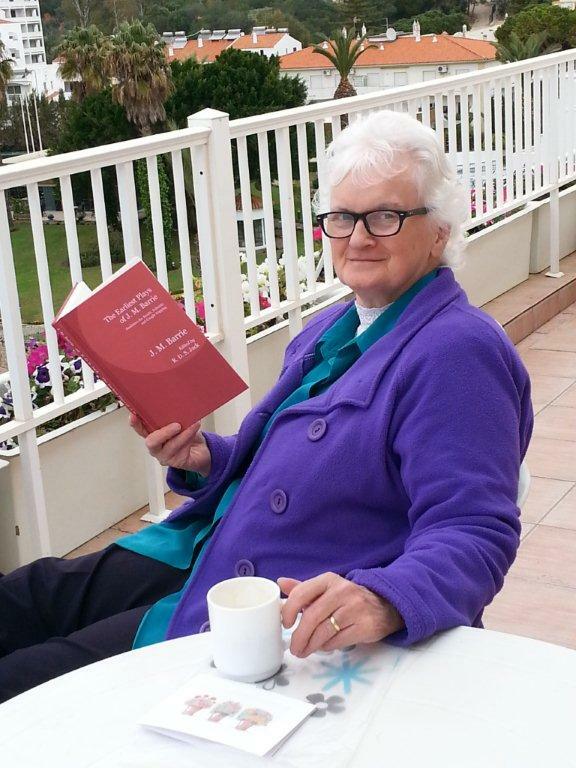 Barrie scholar, who, with her supportive husband David had raised a family in Kirriemuir and knew the territory well. In the following months, which grew into two years, Sandra cheered me on as I wrote my novel, Imagining Helen, based on my great-grandmother’s story. Sandra became for me every writer’s dream, a stalwart alter ego, ever ready to encourage and applaud. Although that manuscript still languishes in a drawer, waiting for an interested publisher to magically materialize, and I sometimes agonize that no one will ever know or care about the beautiful and brave Helen David Black (whose spirit, like an insistent muse, haunts me still), I’m comforted to know that one person truly does care — as if Helen were actually her ancestor too — and her name is Sandra Affleck. In a recent e-mail exchange for this WOW blog, Sandra, now 71 and enjoying her age, shared with me more of her own story, and I’m delighted to pass her words along. I just wanted you to know that I have really enjoyed reading your blog recently. Keep up the good work. More details to follow! Thank you, Gini! I’m hoping to feature more amazing older women in the months ahead. Stay tuned! Very interesting, la Bonnie! Thanks for sharing! And thank YOU for reading, Te! Delightful piece, Bonnie. I’m so glad you could include the photo. It makes me want to cozy up in friendship with her, too! Thanks, Barb. Yes, Sandra is that kind of friend. What a fine, interesting and determined person, Sandra is ! I loved reading about your encounter in Scotland (in my younger years I worked there as an “au-pair”). Sandra is right, “follow your heart”, Bonnie. Thank you, Isabelle! I didn’t know you’d lived in Scotland.